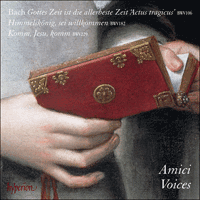 Bach may only have been in his early twenties when he wrote it, but Cantata No 106 (the ‘Actus tragicus’) is a profound contemplation of things final; the motet Komm, Jesu, komm occupies similar eschatalogical territory. This is an inspired programme of some of the most moving vocal music ever written. When Bach took up the job of Thomaskantor and director musices at Leipzig in 1723, he was at last in a position to begin working in earnest towards his personal goal of establishing ‘a well-regulated church music to honour God’ (‘eine regulirte kirchen music zu Gottes Ehren’) in the form of a carefully honed cycle of cantatas that would provide for the entire church year. In Bach’s day the cantata was the principal musical focus of the Lutheran service on Sundays and feast days. Scored for voices with independent instrumental accompaniment, it was usually performed after the Gospel reading, its choice of text intended to illuminate and reflect upon it—to be, in effect, a musical counterpart to the sermon. But although it was in his first years in Leipzig that Bach composed the majority of his surviving church cantatas—perhaps as many as 300 between 1723 and 1728—it was while he was working at the court of the Duke of Weimar a decade earlier that he had taken his first steps towards systematic cantata production, while the original mention of the idea had come even earlier, in a letter of resignation from his previous position as organist at the Blasiuskirche in Mühlhausen in 1708. The desire to compose sacred vocal music may indeed have lain behind his decision to move; Bach had been in Mühlhausen for only a year, but must have realized already that there would be few opportunities to compose vocal music for regular services there; the handful of cantatas he had produced—among the very earliest he wrote—seem to have been only for special occasions such as weddings or funerals. A short chorale for solo organ (the eighth partita from Bach’s variations on ‘O Gott, du frommer Gott’, BWV767, transposed up a tone) precedes BWV229 to set a new character and act as a modulating prelude from the F major tonality of BWV106. This variation is thought to correspond to the seventh verse of Johann Heermann’s hymn, a supplication for the soul and the body after death, beginning ‘Lass mich an meinem End’’. Bach’s move from Mühlhausen to Weimar in 1708 was initially to become court organist, which again meant that there were few opportunities to write vocal music, but in March 1714 he was appointed Konzertmeister, a sort of performance director post but with an added requirement to compose one cantata a month for the court chapel. It was a chance at last to write cantatas for the liturgy, and from this time to that of his departure in 1717 for a new job in Cöthen around twenty cantatas survive. The earliest of them is Himmelskönig, sei willkommen (‘Welcome, King of Heaven’), a cantata for Palm Sunday, which in 1714 fell on 25 March. The cantata would thus have been performed—perhaps with Bach leading from the violin—in the ducal palace’s chapel, known as the Himmelsburg (‘Castle of Heaven’), an unusual and atmospheric space in which the musicians were placed in a high attic gallery from which their playing and singing wafted down on the aristocratic congregation below. It is perhaps no surprise then that Himmelskönig, sei willkommen is in some ways a more distanced work than the intimately involving Actus tragicus. But the difference in air that it breathes can be put down to more than the contrast in subject. With its seamless running-together of short sections, the Actus tragicus was a work still infused by the emotionally focused atmosphere of Bach’s seventeenth-century German heritage, but in Weimar he had entered a more outward-looking musical community, encountering newer, self-contained French and Italian musical forms such as the sonata, overture, concerto and da capo aria that now found their way into his cantatas, and which would become no less important parts of his eclectic musical style. The text, which is unidentified but likely to be the work of the talented Weimar court poet Salomo Franck, concerns itself with the subject of the day’s appointed Gospel reading, namely Christ’s entry into Jerusalem. After a stately, perhaps French-influenced, opening sonata movement for flute and violin with pizzicato accompaniment, the first chorus is a celebration of Christ’s arrival, expressed in lightly worn contrapuntal ingenuity. A short bass recitative intoning prophetic words from Psalm 40 leads to a sequence of three lightly scored arias: one for bass with obbligato violin acknowledging Christ’s love and sacrifice; a substantial one for alto and flute urging humble faith and devotion; and an unsettling one for tenor anticipating the pains of the Crucifixion. A sober fugue follows, its subject based on a chorale melody which appears in its original form sung by the sopranos, claiming Christ’s sufferings as a source of joy for the heaven-bound believer, and the cantata ends with a call to follow Christ which recalls the mood and easy contrapuntal manner of the first chorus. 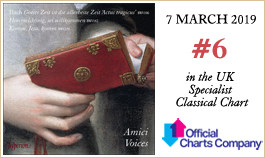 Bach’s handful of surviving motets (it is possible that he wrote considerably more) exist outside the liturgical context of the majority of his cantatas, most having been composed for specific occasions. Musically they differ in having a largely contrapuntal basis with no independent instrumental accompaniment, and in having no division into separate arias or recitatives. They were thus essentially archaic in nature, perhaps deliberately recalling the age of Bach’s great German predecessor, Heinrich Schütz. Usually motets were composed for one-off events such as funerals, memorial services and the occasional important patronal birthday, and it seems likely that a funeral was the occasion for which Komm, Jesu, komm, for eight-part double choir, was composed in the early 1730s—the consolatory text, at least, had been written in 1684 for the funeral of the headmaster of the Thomasschule, when it had been set to music by the then-Thomaskantor Johann Schelle. Bach may or may not have known that piece, but he certainly went his own way in his treatment of the same words, using only the first and last stanzas of the poem, and basically using the first as if it were a piece of extended Biblical prose, making each line the subject of a section of smoothly wrought imitative counterpoint in a succession that builds to form a yearning supplication of exquisite, almost needy tenderness. By contrast the last stanza—a loving submission of the soul to God’s care—is treated to a homophonic but richly harmonized setting, like a more elaborate counterpart of the chorales with which Bach was by this time in the habit of ending his cantatas. Lorsque Bach prit le poste de Thomaskantor et director musices à Leipzig en 1723, il fut enfin en mesure de commencer à travailler sérieusement à son objectif personnel: créer «une musique d’église bien réglementée pour honorer Dieu» sous la forme d’un cycle de cantates préparé avec soin couvrant toute l’année liturgique. À l’époque de Bach, la cantate était le point fort de l’office luthérien du dimanche et des jours de fête. Écrite pour voix avec un accompagnement instrumental indépendant, elle était généralement exécutée après la lecture de l’Évangile, le choix de son texte étant destiné à l’éclairer et à le méditer—pour être, en fait, un pendant musical du sermon. Toutefois, même si c’est au cours de ses premières années à Leipzig que Bach composa la majorité de ses cantates d’église qui nous sont parvenues—peut-être trois cents entre 1723 et 1728—c’est lorsqu’il travaillait à la cour du duc de Weimar, dix ans plus tôt, qu’il commença à poser les premiers jalons d’une production systématique de cantates; mais la première mention de cette idée est encore bien antérieure, dans une lettre de démission de son poste précédent d’organiste à la Blasiuskirche de Mühlhausen en 1708. Le désir de composer de la musique vocale sacrée fut peut-être à l’origine de sa décision de s’en aller; Bach n’avait passé qu’une seule année à Mühlhausen, mais devait déjà avoir compris qu’il y aurait peu d’occasions de composer de la musique vocale pour des offices réguliers; les quelques cantates qu’il avait produites—parmi les toutes premières qu’il écrivit—semblent avoir été destinées uniquement à des circonstances particulières comme des mariages ou des enterrements. Un court choral pour orgue solo (la huitième partita des variations de Bach sur «O Gott, du frommer Gott», BWV767, transposée d’un ton vers le haut) précède le motet BWV229 pour créer une nouvelle ambiance et servir de prélude modulant depuis la tonalité de fa majeur de la cantate BWV106. On pense que cette variation correspond au septième verset de l’hymne de Johann Heermann, une supplication pour l’âme et le corps après la mort, qui commence par «Lass mich an meinem End’» («Laisse-moi à la fin de ma vie»). Lorsque Bach quitta Mühlhausen pour Weimar en 1708, c’était initialement pour devenir organiste de la cour. À nouveau, il eut donc tout d’abord assez peu d’occasions d’écrire de la musique vocale, mais en mars 1714 il fut nommé Konzertmeister, une sorte de poste de directeur musical, mais avec l’obligation supplémentaire de composer une cantate par mois pour la chapelle de la cour. Cela lui donnait enfin l’occasion d’écrire des cantates pour la liturgie et, il nous est parvenu une vingtaine de cantates datant de cette époque jusqu’à son départ en 1717 pour prendre un nouveau poste à Cöthen. La première de ces cantates est Himmelskönig, sei willkommen («Roi des cieux, sois le bienvenu»), une cantate pour le dimanche des Rameaux, qui tombait le 25 mars en 1714. Cette cantate dut donc être exécutée—peut-être avec Bach dirigeant du violon—à la chapelle du palais ducal, appelé le Himmelsburg («Château des cieux»), un endroit inhabituel et évocateur où les musiciens étaient placés dans une tribune très élevée en attique d’où leur jeu et leur chant flottaient en descendant sur l’assemblée des fidèles aristocrates installés au-dessous. Peut-être n’y a-t-il rien d’étonnant à ce que Himmelskönig, sei willkommen soit à certains égards une œuvre plus distanciée que l’Actus tragicus à l’engagement plus fort. Mais la différence d’ambiance ne tient pas seulement au contraste entre les sujets. Avec sa juxtaposition homogène de courtes sections, l’Actus tragicus était une œuvre encore imprégnée de l’atmosphère centrée sur les émotions de l’héritage allemand du XVIIe siècle qu’avait reçu Bach, mais à Weimar il était entré dans une communauté musicale davantage tournée vers l’extérieur, où il se trouvait confronté à de nouvelles formes musicales autonomes françaises et italiennes comme la sonate, l’ouverture, le concerto et l’aria da capo qui trouvèrent alors leur place dans ses cantates et allaient devenir des parties non moins importantes de son style musical éclectique. Le texte, non identifié mais qui est probablement l’œuvre du talentueux poète de la cour de Weimar Salomo Franck, traite du sujet de la lecture de l’Évangile du jour, à savoir l’entrée du Christ à Jérusalem. Après un mouvement de sonate initial imposant, peut-être d’influence française, pour flûte et violon sur un accompagnement pizzicato, le premier chœur est une célébration de l’arrivée du Christ, exprimée dans une ingéniosité contrapuntique agilement portée. Un court récitatif de la basse psalmodiant des paroles prophétiques du Psaume 40 mène à une séquence de trois arias instrumentées légèrement: une pour basse avec violon obligé reconnaissant l’amour et le sacrifice du Christ; une aria substantielle pour alto et flûte exhortant à une foi humble et à la dévotion; et une aria troublante pour ténor préfigurant les souffrances de la Crucifixion. Vient ensuite une fugue sobre, dont le sujet repose sur une mélodie de choral qui apparaît sous sa forme originale chantée par les sopranos, invoquant les souffrances du Christ comme une source de joie pour le croyant lié au ciel, et la cantate s’achève sur un appel à suivre le Christ qui rappelle l’atmosphère et la manière contrapuntique pleine d’aisance du premier chœur. Les quelques motets de Bach qui nous sont parvenus (il se pourrait qu’il en ait écrit bien davantage) se situent hors du contexte liturgique de la majorité de ses cantates, la plupart ayant été composés pour des occasions spécifiques. Sur le plan musical, ils s’en distinguent car ils ont une base largement contrapuntique sans accompagnement instrumental indépendant et ne sont pas divisés en arias ou en récitatifs séparés. Ils étaient donc de nature essentiellement archaïque, rappelant peut-être délibérément l’époque du grand prédécesseur allemand de Bach, Heinrich Schütz. D’habitude, les motets étaient composés pour des événements ponctuels comme des enterrements, des services commémoratifs et l’occasionnelle et importante fête patronale; il semble probable que Komm, Jesu, komm, pour double chœur à huit voix, fut composé pour des funérailles au début des années 1730—du moins, le texte réconfortant avait été écrit en 1684 pour les obsèques du recteur de la Thomasschule, mis en musique par le Thomaskantor de l’époque, Johann Schelle. On ignore si Bach a connu cette pièce, mais il suivit sa propre voix dans son traitement des mêmes mots, en ne retenant que la première et la dernière strophe du poème et en utilisant en fait la première comme si c’était un long texte de prose biblique: il fait de chaque vers le sujet d’une section de contrepoint imitatif habilement travaillé dans une suite qui se bâtit pour former une ardente supplication de tendresse exquise, presque un besoin d’affection. En revanche, la dernière strophe—une soumission aimante de l’âme à l’attention de Dieu—est mise en musique dans un traitement homophonique mais richement harmonisé, comme un pendant plus élaboré des chorals avec lesquels Bach avait alors l’habitude de terminer ses cantates. Als Bach 1723 die Stelle als Thomaskantor und Director Musices in Leipzig antrat, konnte er sich endlich ernsthaft seinem persönlichen Vorhaben widmen, „eine regulirte kirchen music zu Gottes Ehren“ in Form eines sorgfältig konstruierten Kantatenzyklus zu komponieren, der Musik für das gesamte Kirchenjahr bereitstellen würde. Zu Bachs Zeiten war die Kantate der musikalische Schwerpunkt des evangelischen Gottesdienstes an Sonn- und Festtagen. Gesetzt für Singstimmen mit selbstständiger Instrumentalbegleitung wurde sie zumeist nach der Evangelienlesung vorgetragen, wobei ihr Text eine erläuternde und reflektierende Rolle hatte—sie fungierte effektiv als musikalisches Pendant zur Predigt. Ein kurzer Choral für Orgel solo (die achte Partita aus Bachs Variationen über „O Gott, du frommer Gott“, BWV767, um einen Ton hochtransponiert) geht BWV229 voran, um eine neue Stimmung einzuführen und als modulierendes Präludium von dem F-Dur von BWV106 aus zu fungieren. Man geht davon aus, dass diese Variation mit der siebten Strophe des Liedes von Johann Heermann korrespondiert, die mit der Zeile „Lass mich an meinem End’“ beginnt. Bach zog 1708 von Mühlhausen nach Weimar, um dort zunächst die Hoforganistenstelle anzunehmen, was wiederum bedeutete, dass das Komponieren von Vokalmusik nicht in seinen Tätigkeitbereich fiel. Im März 1714 jedoch wurde er zum Konzertmeister ernannt, und zwar mit der zusätzlichen Pflicht, eine Kantate pro Monat für die Hofkapelle zu schreiben. Hier tat sich nun endlich die Gelegenheit auf, Kantaten für den Gottesdienst zu komponieren, und von jenem Zeitpunkt bis zu seinem Weggang aus Weimar im Jahr 1717, als er nach Köthen wechselte, sind etwa zwanzig Kantaten überliefert. Die älteste davon ist Himmelskönig, sei willkommen, eine Kantate für Palmsonntag, der 1714 auf den 25. März fiel. Die Kantate wurde daher wohl mit Bach als Konzertmeister in der Kapelle des Residenzschlosses, die als Himmelsburg bekannt war, aufgeführt, ein ungewöhnlicher und atmosphärischer Ort, wo die Musiker auf einer hohen Empore platziert waren, so dass ihr Spiel und ihr Gesang zu der aristokratischen Gemeinde nach unten schwebte. Es ist vielleicht nicht weiter überraschend, dass Himmelskönig, sei willkommen ein in gewisser Weise distanzierteres Werk ist als der intime, den Hörer einbindende Actus tragicus. Die Unterschiede zwischen den Werken sind jedoch auf mehr zurückzuführen als ihre gegensätzlichen Sujets. Das nahtlose Ineinanderfließen seiner kurzen Abschnitte demonstriert, dass der Actus tragicus noch ein Werk der emotional konzentrierten Atmosphäre der deutschen Musiktradition des 17. Jahrhunderts war; in Weimar hingegen traf er eine mehr nach außen gerichtete musikalische Gesinnung an und lernte neuere, eigenständige französische und italienische Musikformen wie die Sonate, Ouvertüre, Da-capo-Arie und das Concerto kennen, die in seine Kantaten mit einflossen und nicht weniger wichtige Bestandteile seines eklektischen musikalischen Stils werden sollten. Der Text, der zwar nicht eindeutig identifiziert ist, aber mit einiger Wahrscheinlichkeit das Werk des talentierten Weimarer Hofdichters Salomo Franck sein könnte, handelt von dem Thema des entsprechenden Evangeliumstexts, nämlich Christi Einzug in Jerusalem. Nach einem würdevollen, möglicherweise vom französischen Stil beeinflussten, Eröffnungssatz für Flöte und Geige mit Pizzicato-Begleitung erklingt der erste Chor als Feier der Ankunft Christi, die mit federleichter kontrapunktischer Raffinesse auftritt. In einem kurzen Bass-Rezitativ werden prophetische Worte aus Psalm 40 intoniert, was in eine Folge von drei schmal besetzten Arien hinüberleitet: eine für Bass mit obligaten Violinen, in der Christi Liebe und Opfer anerkannt werden, eine ausgedehntere für Alt und Flöte, in der demütiger Glaube und Hingabe angemahnt werden, sowie eine verunsichernde für Tenor, in der die Schmerzen der Kreuzigung antizipiert werden. Es schließt sich eine nüchterne Fuge an, deren Thema auf einer Choralmelodie basiert, deren Originalform von den Sopranstimmen gesungen wird, die Christi Leiden als Quelle der Freude für den gen Himmel reisenden Gläubigen erklären. Die Kantate endet mit einem Aufruf, Christus zu folgen, was an die Stimmung und kontrapunktische Leichtigkeit des ersten Chors erinnert. Die wenigen überlieferten Motetten Bachs (es ist möglich, dass er deutlich mehr komponierte) haben, im Unterschied zu dem Gros seiner Kantaten, keinen liturgischen Kontext, sondern entstanden zum größten Teil für bestimmte Anlässe. Musikalisch unterscheiden sie sich insofern, als dass sie in erster Linie kontrapunktisch aufgebaut sind, keine eigenständige Instrumentalbegleitung haben und nicht in einzelne Arien oder Rezitative eingeteilt sind. Damit waren sie ihrer Anlage nach recht altmodisch—möglicherweise erinnerte Bach absichtlich an seinen großen deutschen Vorgänger Heinrich Schütz. Zumeist entstanden Motetten für bestimmte Ereignisse wie Beerdigungs- oder Gedenkgottesdienste sowie gelegentliche wichtige Geburtstage von Mäzenen oder Förderern. Aller Wahrscheinlichkeit nach war eine Beerdigung der Anlass, für den Komm, Jesu, komm für Doppelchor zu acht Stimmen zu Beginn der 1730er Jahre komponiert wurde—der tröstliche Text zumindest war 1684 zur Beerdigung des Rektors der Thomasschule entstanden und dann von dem damaligen Thomaskantor Johann Schelle vertont worden. Es ist möglich, dass Bach jenes Stück kannte, doch verarbeitete er denselben Text nach eigener Façon, indem er nur die erste und letzte Strophe des Gedichts vertonte und die erste praktisch so behandelte, als sei sie eine längere Passage biblischer Prosa, und indem er jede Zeile mit einem sorgfältig ausgestalteten imitativen Kontrapunkt versah, so dass sich insgesamt eine sehnsüchtige Bitte von exquisiter, fast bedürftiger Zärtlichkeit ergibt. Im Gegensatz dazu erklingt die letzte Strophe—eine liebevolle Übergabe der Seele in Gottes Obhut—als homophoner Satz mit üppiger harmonischer Aussetzung, etwa wie ein aufwändigeres Pendant zu den Chorälen, mit denen Bach zu jener Zeit seine Kantaten beendete.